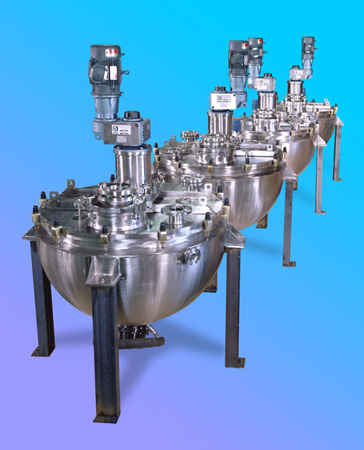 Pictured are custom 185-gallon melt kettles rated for full vacuum and 250oF. Each hemispherical vessel is jacketed for 15-psi steam. A submerged steam calandria is also supplied for additional jacketing and heating. Both the vessel and jacket are constructed in accordance with ASME Section VIII Division I standards. Charles Ross & Son Company, maker of Ross mixers, dispersers and blenders, also caters to custom fabrication projects including storage tanks, pressure vessels and reactors. Ross operates eight facilities worldwide fully equipped with advanced design, engineering and manufacturing tools for fabricating vessels are large as 100,000 gallons for virtually any simple, complex or sanitary application. The custom kettles are agitated by a two-wing anchor driven by an explosion-proof motor. All product-wetted surfaces are dye penetrant tested to confirm that there are absolutely no cracks or crevices. Special mechanical seals, level sensors, actuated diaphragm discharge valves, electrical controls and alarm panels are also provided.